Marion County biologists captured a dangerous bear from the Juniper Prairie Wilderness Area campsite. MARION COUNTY, Fla. - Marion County biologists captured a bear they considered dangerous at the Juniper Prairie Wilderness Area campsite and had it killed. 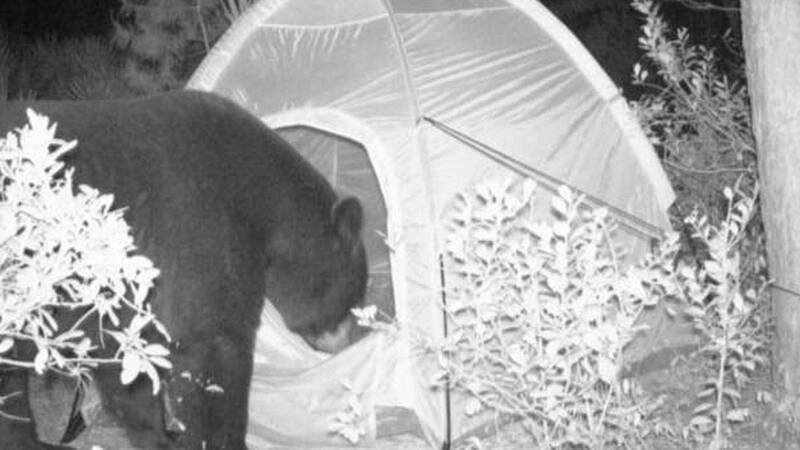 Florida Fish and Wildlife Conservation Commission officials had received multiple reports of the bear entering tents. Once officials received the complaints, the U.S. Forest Service closed the wilderness area. Biologists proceeded to set up an empty tent and trap. FWC officials said the same bear came to the tent twice and showed no hesitation before entering the tent. The bear was caught by the biologists. Officials said since the bear posed a threat to people camping in the area, it was humanely killed. The bear had entered a tent this past January after campers followed proper protocol. Biologists said campers before them did not follow the guidelines and the bear associated tents as a place to find food. Ask your local ranger if bears are active in your camping and hiking area. Make noise if you see a bear, black bears usually avoid people. Any food, sprays or toiletries with a scent should be stored in airtight bag. Food should be raised 10 feet above the ground. Do not cook and eat in the same area you sleep. Make sure your dogs are on a leash.